I was a child of the 70’s and 80’s and as such I was brought up with the BBC children’s programme Jackanory, a half hour storytelling show with one narrator who drew the audience in with the power of words alone. 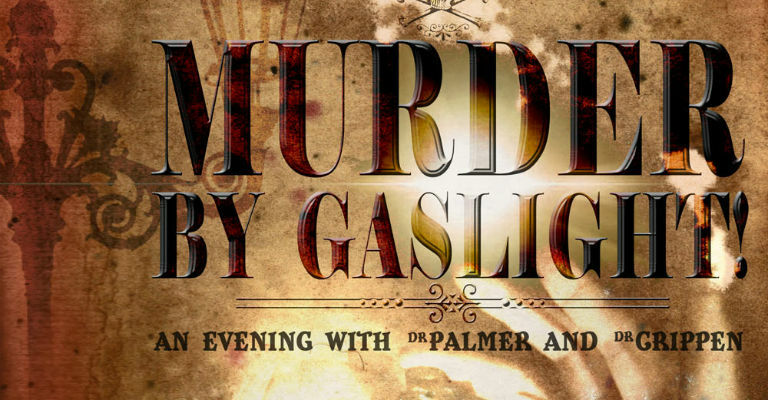 I loved it, so I was very excited when I realised that Murder by Gaslight was a one man, two act retelling of grisly Victorian/Edwardian horror. Written and performed by Jonathan Goodwin, the two tales are very imaginatively staged. Playing to a very intimate audience (the numbers are purposefully limited) we were sat on the stage in a semi-circle which, due to simple but very atmospheric lighting, became deliciously claustrophobic by the end of the evening. The two ‘murderers’ – William Palmer and Hawley Crippen – are well known to fans of the macabre, but Jonathan not only brings these stories alive, he adds quite a unique approach to both which stops this from being a simple recounting of the normal prose. Palmer is an infamous serial poisoner from Rugeley, known to some as the Prince of Poisoners, whose constant chasing of wine, women and the old ‘jingle jangle’ meant he was always finding himself in situations requiring a tincture or two. For this show, we find Palmer in his cell awaiting the hangman and so to kill time (pardon the pun) he recounts his life. It is testament to Goodwin’s writing that within the first few minutes you forget that you’re sat on the stage watching a performance and instead can almost smell the stench and taste the damp of a Stafford prison cell. Palmer was undoubtedly a man of much persuasion and little morals, which, when coupled with the access and know-how of poisons made for a very deadly combination. What Goodwin does very well is to give glimpses of the man whilst never letting the audience forget about the monster. Following the interval we meet Dr Crippen, whose ‘other’ claim to fame was to have been the first person to be arrested with the use of the Marconi Wireless telegraph. Crippen was a native of Michigan who studied to be a homeopath. On moving with his wife to London he found his credentials to be pretty much useless and so was unable to secure a high paying job, resulting in his overbearing and materialistic wife to pursue many extra marital affairs, cuckolding him in the family home. If story is to be believed, it was through this behaviour that Crippen finally reached the end of his tether and he killed her. Crippen, however, maintained until his death in Pentonville Gaol that she had left him to return to the States and the remains in his cellar were unknown to him. For this tale, Goodwin brought us into Crippen’s London home, 39 Hilldrop Crescent, where the mild mannered and somewhat meek Doctor explained his side of the infamous events. Once again, Goodwin’s writing is first class. The characterisation of Crippen is brilliant and his acting, complete with a wonderful Midwestern accent, is strong, making the idea that perhaps Crippen was the victim of a malicious wife and an overzealous police force very persuasive. In this day of instant gratification through special effects, clever (and expensive) staging and over complicated plots designed to show off rather than just show, Jonathan Goodwin has brought two deep and dark stories to life and resurrected the art of storytelling in its purest form. It was a brilliant example that young and old most definitely should go and see. For more information on events happening at the Tyne Theatre & Opera House, visit their official website.